I associated the name "Princess" with fragile and vulnerable things, but when I unpacked my new princesses I was surprised by their superb construction quality and sturdy looks. The princesses are assembled without a trace of asymmetry or deformation. That gave confidence and pleasant anticipation. 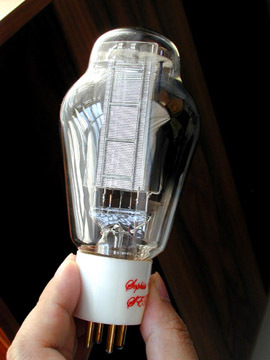 The Princess tubes took the place of 2A3 tubes after changing the heater-voltage to 5V (AC), B+ voltage to 370V and the cathode resistor to 560 ohm. The primary of the OPT (Tribute OPT with amorphous core) is 5k. When starting listening to music I was struck by the sense of power and distinction of timbres in the instruments. This impression stayed. The music kept on coming with ease, clarity and convincing power. This, and the sophistication of the sound is the most striking quality as compared to the 2A3. The 2A3 has a more forward, "here I am"-sound, less space, less body, and a sense of nearness with voices. The Princess (what a name! I suppose we can expect as completion of the range a "King", "Empress" and a budget-type "Baron"), while being able to reproduce wind instruments with bite and blast when required, does this in a natural, easy-going way. I think the tubes produce great clarity and space, clean pulses, and are capable of rendering the timbres of the instruments convincingly. The same for voices, either throaty or full-bodied sonorous. Low frequencies, though a bit over-warm at first (see below), are now very pleasant, precise and powerful. As mentioned, the heater-current I have now is AC. On my speakers (97dB efficiency) this causes an audible hum when the room is very quiet (7mV RMS on the speaker connector). 6 dB less hum could have been just acceptable and this could be have been achieved if the heater-voltage would was 2,5V instead of 5V. So, to make the tubes really quiet the heater-current must be changed to DC. Also, I don't like the idea that while the average voltage-difference between cathode and grid is 24V, one end of the cathode is 21,5V and the other is 26,5V. Another thing is the rather high Ri. Measures to flatten the two high humps in the impedance characteristic of my 250 liter reflex enclosures proved beneficial to the bass registers. While the AC/DC thing is personal and the Ri might not be problematic or can be dealt with, the build and performance of these tubes is superb. Tube characteristics can be found here.